low phase noise, and optional ramp sweep capability. The E8257D-567 generates signals at microwave frequencies up to 67 GHz. The instrument is operational to 70 GHz, but only typical performance specifications are provided in the 67 GHz to 70 GHz frequency range. See the data sheet for details. Additional frequency range options are available to configure the PSG to meet your specific test needs. Option 567 is required for signal generation applications that call for carrier frequencies at or below 70 GHz. Common uses include test stimulus generation for component and receiver test in point-to-point and point-to-multipoint broadband wireless communications systems, radar and electronic warfare systems, and satellite systems. 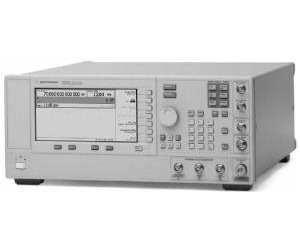 Check out this great video "Millimeter-Wave Solutions for Signal Generation and Analysis |PSG Signal Generators | Agilent"